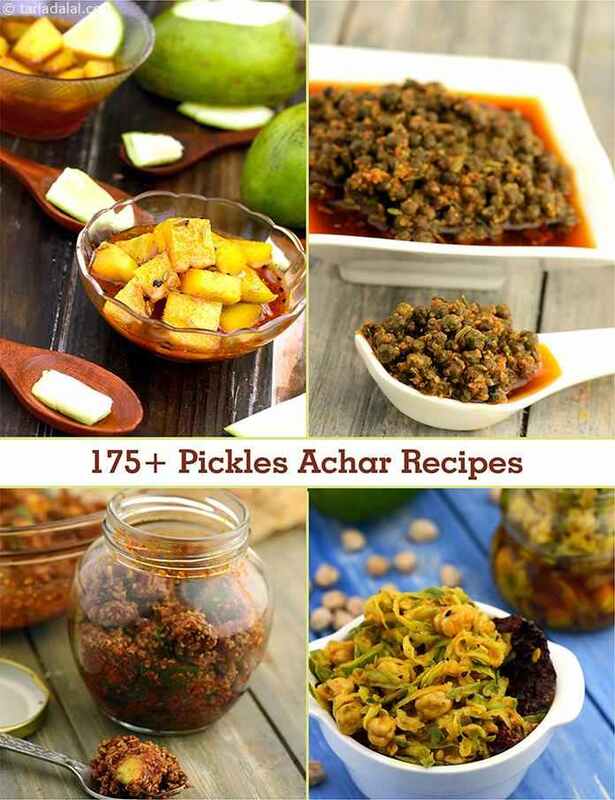 Indian pickle recipes collection, achaar recipes. Spicy, tangy, sweet, or a combination of these flavours, you name it and there are pickles to suit your taste! Pickles (Achar) go well with Parathas and Rotis of all types and are served with most meals to add to the spice quotient. While some quick-fix achars are made in small quantities and stored for just a few days in the Refrigerator, others are made in large quantities and stored for a year or so. This section is your gateway to the world of pickles, with tongue-tickling options like Spicy Mango Pickle, Carrot Pickle, Aam ka Achaar, Drumstick Pickle etc. Sugar based pickles like Aam ki Katki ka Muraba, Methambo, Sweet Lemon Pickle are quite popular. Murabba or "morabba" is an Arabic word meaning to preserve. It is made with finely chopped raw mangoes cooked in sugar syrup and spiced with sambhar masala. Sambhar masala (Koro Sambar/Methia No Masala) is a zingy spice powder. This tongue-tickling masala is a joy to experience, especially during the winter and monsoon days. Kishmish ka Murabba is a unique pickle made of raisins, sweetened with brown sugar and honey. Nimboo ka Achaar is an all-time favorite, with fans spanning across generations! Sweet Peach Pickle is another innovative pickle made by stewing peaches in spiced sugar syrup. Not all pickles are time-consuming. Quick pickles like Bhindi Til ka Achaar, Tendli ka Achaar, Sweet and Sour Raw Papaya Pickle, Garlic Pickle, Carrot Pickle , Fresh Turmeric and Ginger Pickle take hardly any time to cook. Simply toss crispy bhindi with lemon juice, spice powders and red marinade to make this delicious Bhindi Til ka Achaar. Similarly, you can try Tendli ka Achaar by pickling them in spices. You can almost pickle everything in order to prolong its life - hard berries, onions, raw mangoes, green chillies, carrots, cauliflower, turnips, limes and what you have on hand. Apart from the different types of podi and chutneys that go along with most South-Indian meals, authentic simple dishes like Curd Rice and Bisi Bele Bhaat taste amazing with Lemon pickle or Mango pickle. Best quality raw mangoes are marinated with generous quantities of mustard seeds and chilli powder in sesame oil. The mango pickle is put away in a jar for at least a week before it is served. Drumstick Pickle is made by sautéing and marinating drumstick in a tangy and spicy masala base that lends the pickle strong flavors. Madras onions are widely used in Southern Indian cuisine. Simply marinate them in an array of spices and red marinade to make Madras Onion Pickle that could be served with rice, spicy vegetable, curries or parathas. Whether or not you have made subzis, dals and kadhis, a meal never seems complete without a tangy, tongue-tickling Achaar or Launji. Undoubtedly, Rajasthan has a delightful collection of accompaniments like Shimla Mirch ki Launji, Methi ki Launji and Tamatar ki Launji, which are enjoyed with their meals. An evergreen Rajasthani recipe, the Amla Murabba is a wonderful accompaniment to any meal, soft amlas are sweetened and enhanced with aromatic spices like cardamom and saffron. Also, you can make this spicy Amla Pickle by marinating amla wedges in a coarse mixture of nigella seeds & fennel seeds and other aromatic spices. Ker is a berry exclusive to Rajasthan, it is used in many interesting ways in their cuisine. Ker ka Achaar is an aromatic and appetizing achaar spiced up with a variety of seeds. I still remember the large porcelain jars of Methia Keri and Golkeri that would arrive every summer from my nani’s home. It tastes great with khakhras, theplas and parathas! Also, the arrival of summers brings back memories of me grating raw mangoes with my granny which are then turned into authentic pickles like Chundo. The traditional preparation of chunda involves dissolving sugar till the pickle reaches a clear syrupy consistency and the mango shreds are translucent. This Quick Mango Chunda is easy to prepare as all the ingredients are combined and cooked in a pan. Also, you can enhance the taste by adding onions to make this Kaanda Aur Kairi ka Choonda which can be relished with masala puri or parathas. Gujarati famous breakfast Fafda – Jalebi is surely incomplete without Raiwala Marcha and Kacha Papaya Sambharo. Sambhaar is a spice mix that is readily available in most Gujarati households. Kaachi Keri No Sambhaar is a no-fuss, easy to make pickle made by just mixing cut raw mangoes with oil and sambhaar powder. Enjoy our Indian pickle recipes collection, achaar recipe and other Accompaniments Recipes below.